Åke & Peders Pictures on the RB "Willie"
The building of "Wille" was started during the spring of 2002 and the "Willie" seen in the pictures below is actually the second divable version. "Willie" is named for the killer whale because of the very characteristic noise of the dump valve. 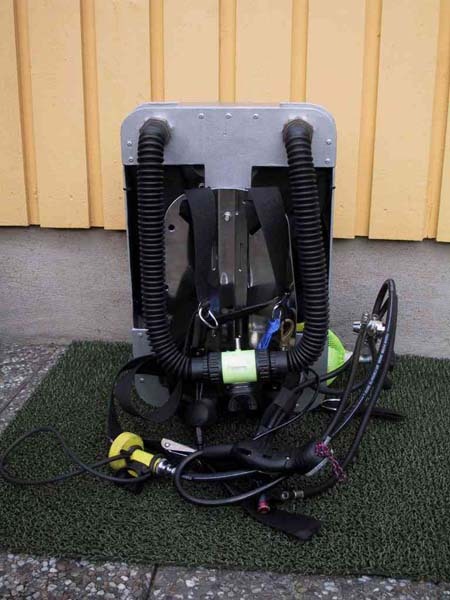 The proud owner and designer of Willie is mr Peder Seippel, a dedicated diver living in Stockholm, Sweden. He can be contacted at peder@seippel.nu.Make sure you check his page at www.seippel.nu. The "Willie" of today is a constant mass flow SCR with back mounted breathing bags, but work is on-going at the moment to add KISS CCR functionality during the autumn. The unit with cover on. 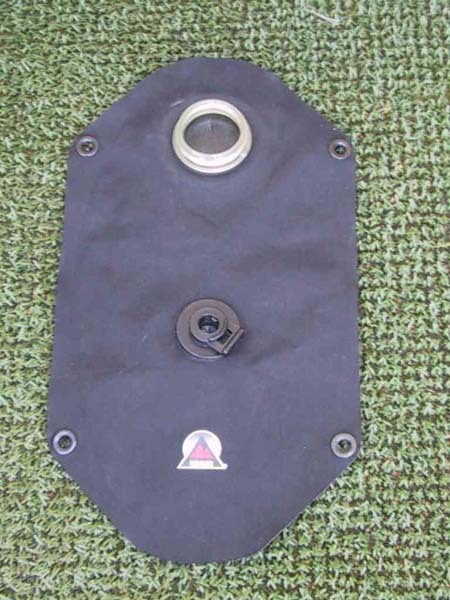 The over pressure dump valve (a. SI-teck dry suit valve) is seen to the right. A 5L 200 (i.e. 35 cubic feet for you imperial freaks) with a Poseidon 1st stage feed the unit. The first stage is ambient referenced thus allowing a slight increase in fresh gas flow with increased depth but also makes it possible to use an ordinary 2nd stage as a bailout, just like the Draeger Ray. "Willie" without cover. 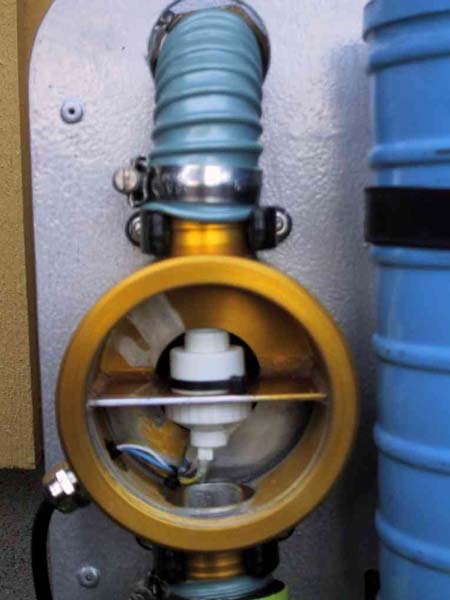 The scrubber is an IDA canister that houses 2kg of soda lime. 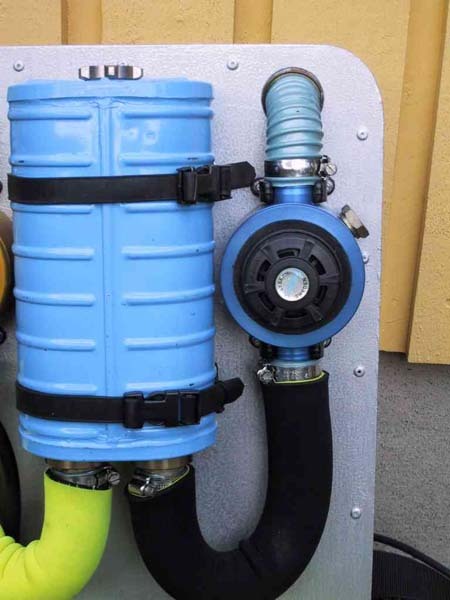 The breathing hoses connect to a screw connector at the end of the two corrugated hoses at the top. The exhalation side is to the right. 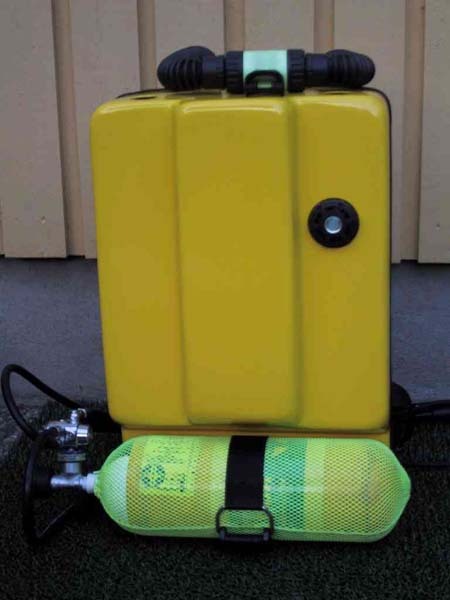 The breathing bags connect under the two (yellow and blue) aluminium boxes. 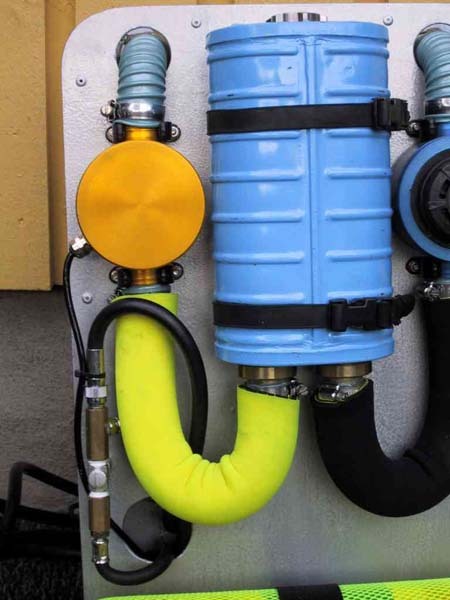 The blue box houses the dump valve and the yellow one the oxygen sensor. Fresh gas is added directly into the inhalation bag. The needle valve (Swagelok, what else...) used for flow control is located to the left.. Without the cover seen from the front side. A standard back plate and wing is used even though the wing was not mounted during the photo session. The DSV and hoses are from Ambient Pressure, i.e. Inspiration. The Oxygen gauge is low to the right (with a violet strap) and bailout regulator to the left. The bypass valve is the small red button see far down on the picture. Close up of the exhalation bag. It is a standard dromedary bag. 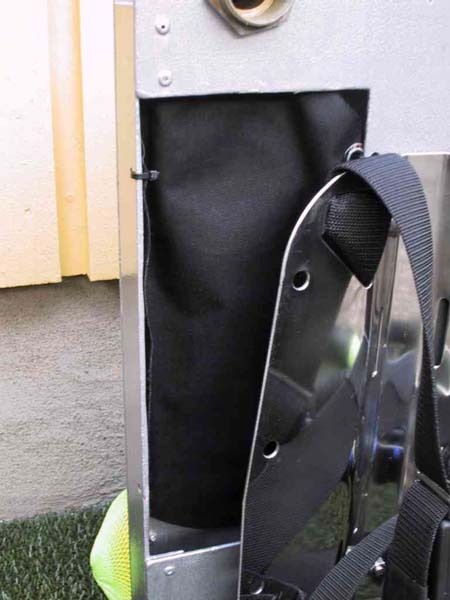 The bag is placed relatively close to the back and is then allowed to expand all the way down to the back plate. 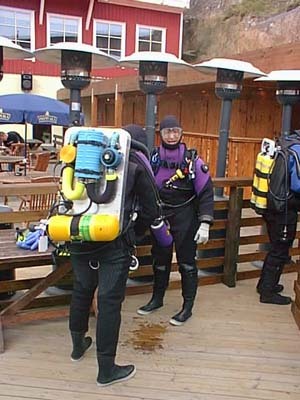 The result is that the negative hydrostatic load inherent with back mounted bags is minimized. The canister and dump valve. 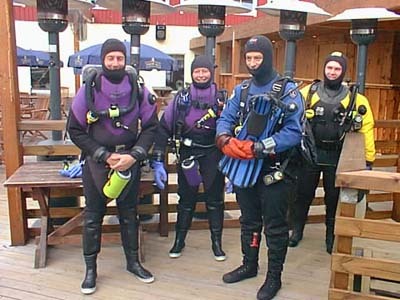 The valve is a SI-tech dry suit valve. This particular valve gives off a distinct sound when dumping gas, that sound is the reason for the name "Willie". It sound like the tame killer whale in the film. The blue housing has a (unused) penetrator for oxygen sensors as well. All hoses that convey breathing gas are insulated with neoprene covers..
Close up of the inhalation side with the (back side of the) needle valve seen as well as the cable penetrator for the oxygen sensor. Oxygen sensor, R22d mounted in the inspiratory gas path. The oxygen gauge, this is a modified submersible pressure gauge (according to the original idea of mr Ola Lindh), this extremely compact and rugged oxygen gauge contains battery, cal pot and digital voltmeter. 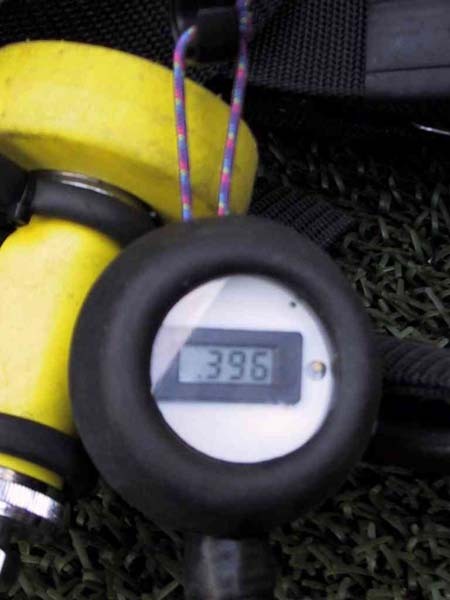 This oxygen gauge will have a page of its own soon. 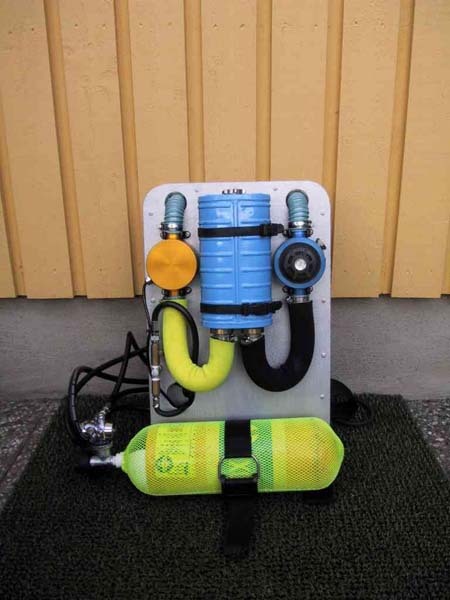 The inhalation bag, a 2 litre dromedary bag with a quick connector (a Buddy Classic inflator port) for fresh gas supply. If a larger bag would be necessary one day in the future, the RB can house up to two 4 litre bags. The exhalation bag is identical but lacks the fresh gas injection port.